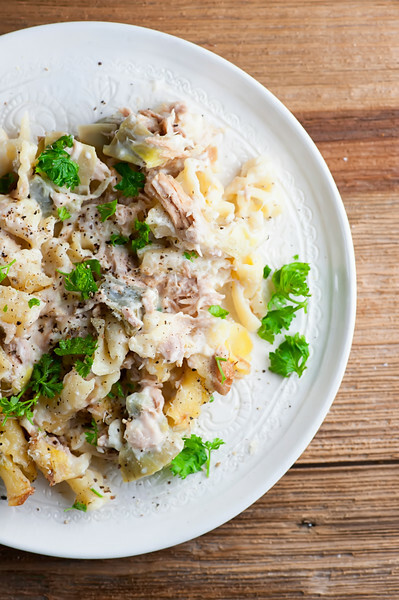 This recipe for Mediterranean Tuna Casserole is NOT your grandma’s tuna casserole recipe! Feta cheese and artichoke hearts shake up this classic supper. Okay, so this is definitely NOT your grandmother’s tuna casserole. Yes, there is tuna, and yes, there are noodles. But there are also artichoke hearts and there is also feta cheese, and there is absolutely no cream-of-anything soup. It’s light and flavorful with the perfect mixture of cheese and artichoke and just the right amount of pasta. I’m calling it a Mediterranean version because of the feta and artichokes, but you can also call it scrumptious…let’s make it! I should start by saying, no disrespect to the grandmothers out there…my favorite recipe on this entire blog is my own grandma’s recipe for molasses cookies. And I have certainly been known to make my share of things that involve a cream-of-something soup. But I do love this lightened-up version of one of my favorite classic suppers. I pretty much love anything with either feta cheese or artichoke hearts. Happiness! And speaking of Mediterranean, have any of you guys tried the Mediterranean Diet? The Southern husband and I are smack in the middle of doing the Whole 30, and from what I understand, the Mediterranean Diet sounds like a perfect next step, because I think it involves a little cheese and some whole grains and RED WINE. So if you have any intel on it, let me know in the comments! In the meantime, this casserole is not only a delicious spin on an old favorite, it’s also a snap to put together. There’s only about a half hour or so between you and a bubbling golden casserole full of tuna wonderfulness. 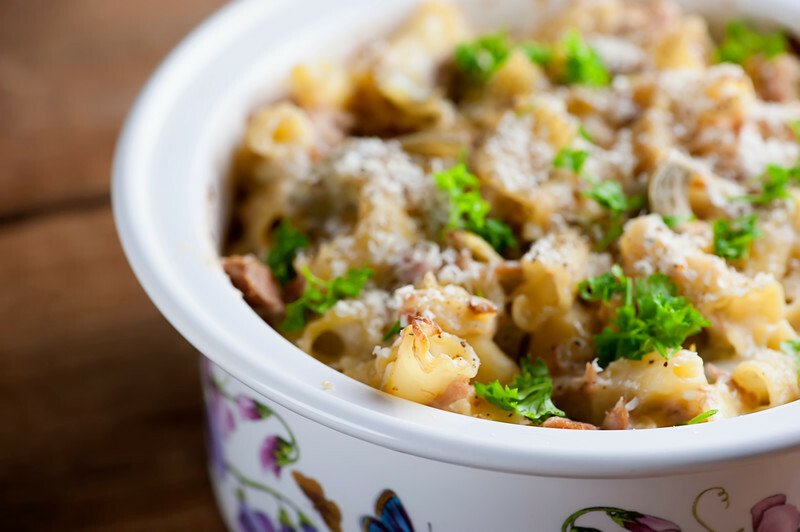 So if you (like me) are always up for shaking things up, at least in the tuna casserole department, give this one a try! Preheat oven to 400 degrees and spray a medium sized casserole dish with cooking spray. Put oil in a medium saucepan over medium high heat. Add flour and stir for one minute. Slowly pour in milk, stirring until smooth and simmering. Turn off the heat and add cooked pasta, tuna, artichoke hearts, feta cheese and scallions to the pot. Add a pinch each of salt and pepper, and stir. Pour into casserole and sprinkle with Parmesan. Bake until golden and bubbling, about 20 minutes. Perfect pasta those campanelle! To me it lends an elegance. I use it for my pumpkin-sage sauce. :-) Looking forward to trying this recipe out. I love campanelle – so many cute nooks and crannies! You had me at feta and artichoke hearts! 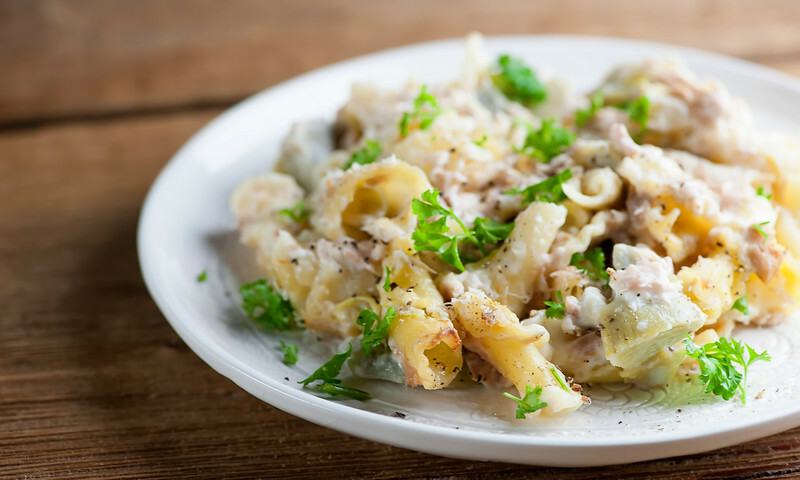 And with Lent coming up next month, this is a great recipe to put in the “Friday File” for a nice change from ordinary tuna casserole.